Motherhood is really, at its core, about perseverance and deliberate, focused endurance. I don’t mean just the physical kind…more often, it is the emotional and spiritual kind. It requires the kind of tenacity that frankly, few women in our age are willing to develop. Not the tenacity to simply run a household, though the mechanics of that are a very real part of our job. But the motherhood I’m talking about encompasses a whole world besides; a world where hearts are painstakingly drawn out, attitudes are carefully monitored and molded, and life-lessons that can only be taught through the zeal of a mother are learned. Quite frankly, we’ve probably all had days we thought, “this would be easier if someone else were doing it.” And someone else might be able to handle the mechanics. Maybe even more efficiently. But we’re talking about mother-love: that all-encompassing vocation that has been given only to us. I have to re-think before I speak. The pile of shoes may be bothersome, but they also may be an opportunity to shape my character which will transfer to my children. The moment of bickering calls me to dig deep into the well of my being and carves out of me a more patient and loving spirit–if I let it. That, too, is simultaneously working in my children’s character. This short time is fleeting. They will carry a part of me into the rest of their lives. Which part? Get alone, get quiet, get still, and ask the Lord to bring the vision back, if you are struggling to hold on to it. This is big. Rise to the occasion on the wings of Him Who is able. It seems like in my 7+ of years of homeschooling, I’ve been constantly rebooting – getting a new “plan” every week of it. I tell the kids, think of all the patience we’re building! Good word! This is exactly what The Lord has been saying to me lately. This race is long and hard and I must keep myself fueled up with the Word! Thank you for this reminder! This is amazing. Thanks for writing this. 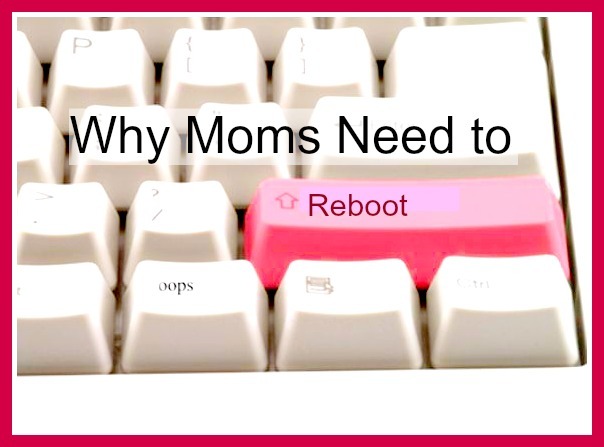 I SO agree and often don’t feel like rebooting. I look at the families where the mom’s do this and I like what I see. Thanks for the challenge. By God’s Grace. This article really resonated with me. My oldest (and only daughter) will be 30 on Sunday. I also have three sons ages 26, 20 and 12 who all live at home. In some ways it never gets easier, it just gets different. You never stop being a mom no matter how old they are or how independent they are. Had to share this on both my personal Facebook page and my homeschooling website’s Facebook page. So good, so timely. Those two paragraphs really spoke to me right where I’m at just now. Thank you. This part really hit me! I’ve allowed myself to be overwhelmed and cranky too often latey! Thank you for this!